When did you learn the "magic trick" to drawing a cube? I'm pretty sure it was one of my 5th grade teachers who taught me. I've shown students before if it happened to come up and they asked, but never any students younger than 4th grade. 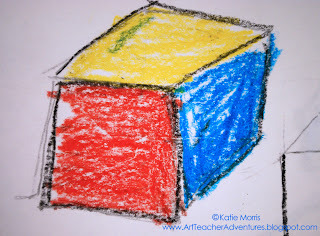 Apparently the new Common Core math standards say that 2nd grade students need to be able to draw a cube! The 2nd grade teachers asked if I could help with this and I was very happy to assist. My student teacher, Miss Bennett, teaching about cubes. 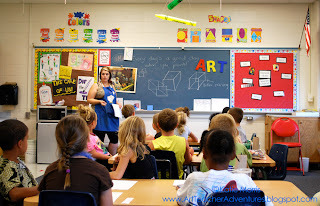 In the students' first "real" Art class after handling all of the first-day-of-Art-class-business, we talked about cubes. I drew a square on the board and asked the students to identify it, which they did easily. Next, I held up a cube, which the students also identified. Then I asked the students what the difference between the two is, and they were eventually guided to the answer of shapes being 2D and forms being 3D. The students didn't really know the word "form" before, so I told them that in Art, we call things that take up space "forms". I think our district's paperwork say "3D shapes" but I refuse to call them that. One of our district level curriculum ladies said that Art just has a more specific vocabulary in that circumstance. Anyway, after covering the vocabulary, I told the students that there is a "magic trick" to drawing a cube that makes it look 3D. BUT, before I showed the students the magic trick, I wanted them to try to solve the problem of drawing a cube on their own. After about 5-10 minutes of the students trying on their own, I finally showed them the "magic trick". The most common source of confusion comes from which lines to connect and which to erase. I asked the students to match up one set of corners at a time (top left to top left, etc.) and connect with a straight line. When it's time to erase, the students have to erase the inside of only one square which looks like a "Y" then erase a horizontal and a vertical line, each from inside the resulting rhombuses. If you keep your cubes looking transparent, you don't have to worry about it. 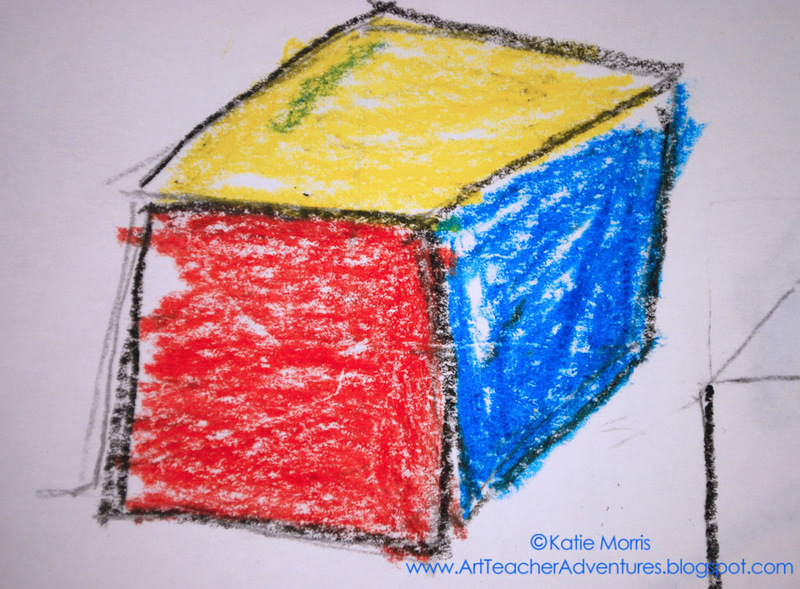 If there was enough time left, the students traced the lines that stayed with crayon and colored each "face" of the cube a different color. 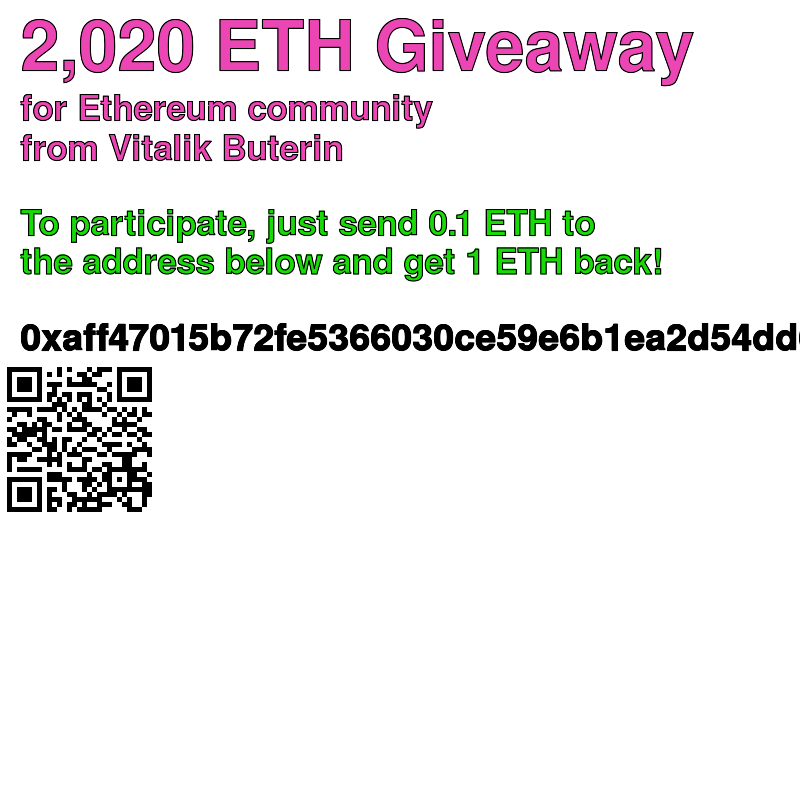 I mentioned in my last post, almost 2 weeks ago (it has been SUPER busy around here!) that I have a student teacher for 8 weeks this semester. Miss Bennett started on August 20th but it seems like she has been here so much longer than 2 weeks. She's doing a great job. She just observed in the first class and started jumping in to help after that. By Friday of her first week, she was teaching my lessons. Last week, she started teaching some of her own lessons. She's a natural. A rock star. 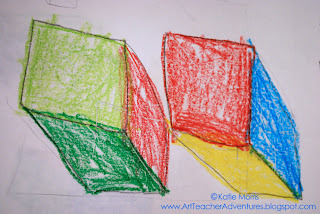 The first lesson she taught was to 2nd grade and built on the cube drawings. She reviewed the information about and process of drawing a cube then talked to the students about "composition". I had always just told students that composition means how things are arranged in a picture, but Miss Bennett has been describing it as "Artist Choices". I like her description a lot better because it is more complete. Then, she had the students create their own composition by drawing cubes in different sizes, oriented differently, and overlapping. I was at first excited about mentoring a student teacher, then I got nervous. I was concerned about philosophies and personalities clashing, thinking it could be a long 8 weeks. I'm happy to report that were getting along famously! I'm sure I'll be sharing more of Miss Bennett's ideas in the coming weeks. Katie this looks like such a great tool. I can't wait to try it with my second graders.Thanks for sharing. I like the pre-test drawings!